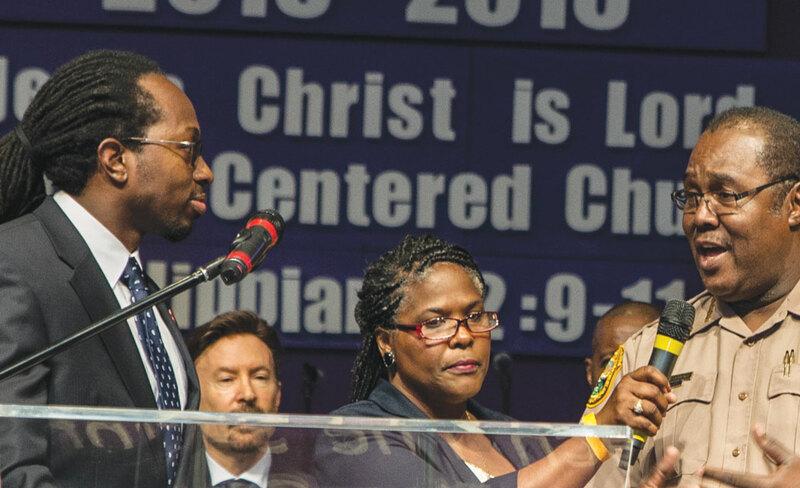 With nary a seat left at the spacious New Birth Baptist church in North Miami, members of PACT (People Acting for Community Together) gathered for its Nehemiah Action Assembly. Three specific issues were on the agenda that the organization with 35 churches and two universities strong presented to officials from local police departments, the Miami-Dade County Commission, the Juvenile Assessment Center, the State Attorney’s Office and the Miami-Dade Public Schools. In a handout that included the agenda items, a statement on “Engaging Power: Preparing Ourselves for Reactions from Power People” distinguishes public from personal relationships. The former, it explains, must be based on making commitments and holding each other accountable. “We are not concerned about being liked; instead, we are concerned about getting something done,” it reads. Getting something done was the prevailing theme of the assembly. No official was being blindsided, because “this is not the first time that these, our public officials, have been presented with these issues. We have met with them ahead of time and we have sent them letters with exactly the questions that we put before them tonight,” Marino stated. After his “yes” reply, Patterson put the shoe on the other foot and asked the audience for help with two forthcoming initiatives. “Miami-Dade police will need your support in the future for body worn video cameras and your support for our real time crime reporting system,” he said. The first “no” response came from Arnold Montgomery, director of MDPS’ Office of Educational Equity, Access and Diversity, regarding his authority to speak for Superintendent Alberto Carvalho and his ability to approve a restorative justice pilot program, an alternative proposed to help lower the suspension rate. Restorative justice programs allow youth who have committed minor offenses in school to face their victim with trained school professionals in an atmosphere of redemption and resolve. Similar programs have reduced the suspension rate in Duval County by 80 percent, according to PACT. Montgomery did accept PACT’s request to continue negotiations in an effort to reach an agreement. As it relates to affordable housing, PACT was able to secure agreement from Miami-Dade Commissioners Dennis Moss and Daniella Levine-Cava to provide leadership to activate the Affordable Housing Trust Fund and to work on a plan to secure funding. Although approved in 2007, the trust has existed on paper only since it has no sustainable source of money, no one running the fund, no one raising money for it and not even an order to implement it. According to Rev. Robert Brooks of St. Peter’s Missionary Baptist, the trust fund will need at least $200 million in order to make the necessary impact, however, PACT is proposing that commissioners commit to securing $10 million annually by 2017. “Without adequate funds, there is no housing trust fund,” Brooks said.